Flooding has cost Iowa communities more than $18 billion in the last thirty years, and as the Mississippi and Cedar Rivers continue to swell this spring, Iowans may wonder how much they can expect to pay out on flood disasters in the future. 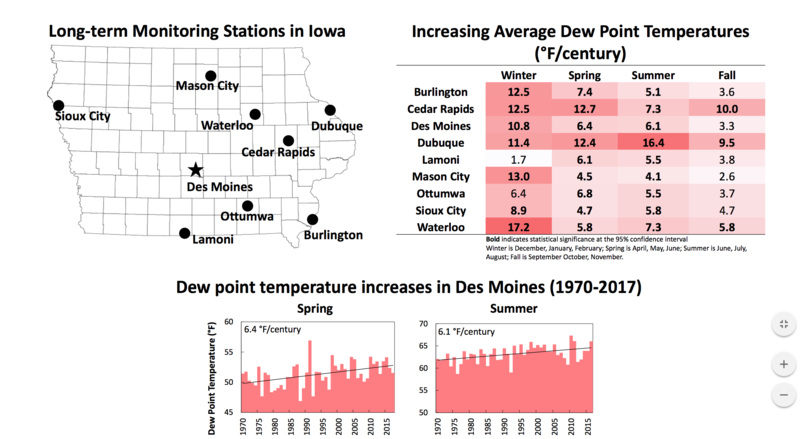 In recent years, scholars at the Iowa Flood Center have been working to predict just that. HAZUS, developed by the the Federal Emergency Management Agency, provides predictions of the economic impact various magnitudes and types of natural disasters might have across the United States. During 2017, Research Engineer and Assistant Professor Ibrahim Demir and graduate research assistant Enes Yildirim, combined HAZUS’ information on demographics, buildings and structural content with data from the Iowa Flood Information System (IFIS). As a result, IFIS now offers flood loss and economic damage estimations for twelve communities in the state. These include Cedar Rapids, Cedar Falls, Des Moines, Fort Dodge, Iowa City, Independence, Kalona, Monticello, Ottumwa, Rock Rapids, Rock Valley, and Waterloo. HAZUS’ model makes it possible for users to not only view the overall economic damages to a community but also how much in damages individual buildings can be expected to accrue. Iowa Flood Center researchers are working to expand this predictive model to other parts of the state. For now, users can use the following guide to learn more about the financial consequences of flooding in any of the aforementioned communities. Hover their cursor over the “Flood Maps” tab and find their community under the “Flood Map Scenarios for Communities” button. After clicking on the “Damage Estimate” button, users can toggle the “Flood Map Controller” to model different scenarios. This week’s On The Radio segment discusses the growing economic consequence of climate change. Transcript: Human-induced climate change costs more than the U.S. economy can afford according to a recent report from the Universal Ecological Fund. Titled, “The Economic Case for Climate Action in the United States,” the report found that severe weather intensified by climate change and the health impacts associated with burning fossil fuels have cost the U.S. economy $240 billion per year in the last decade. 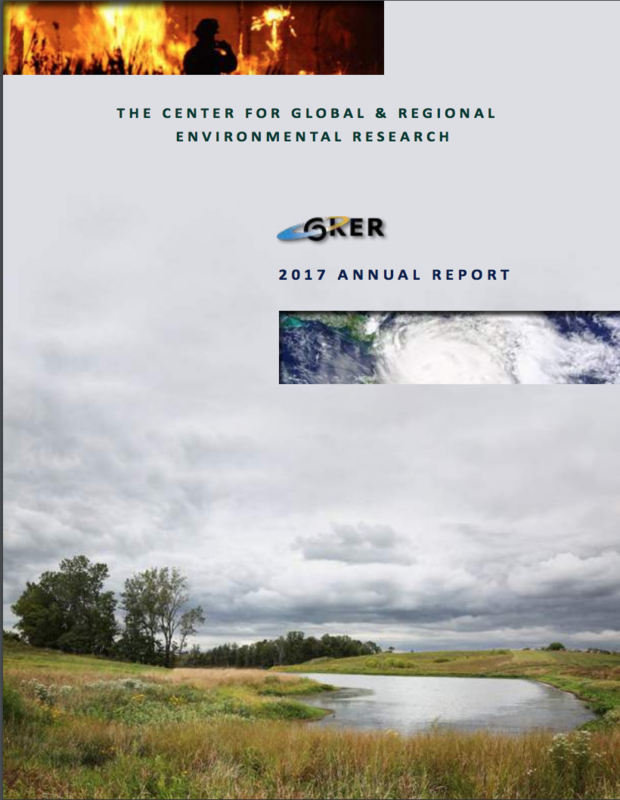 The authors point out that the number of extreme weather events resulting in $1 billion or more in damages has increased by 400 percent since the 1980s. Iowa, for example, has endured three floods costing more than $1 billion in the last decade, up three-fold since the 1990s. If climate change is not curtailed, researchers predict costs associated with severe weather and the health impacts of emitting greenhouse gases will reach $360 billion annually. Human-induced climate change costs more than the U.S. economy can afford according to a recent report from the Universal Ecological Fund. “The Economic Case for Climate Action in the United States,” published recently by the non-profit research organization, found that severe weather intensified by climate change and the health impacts associated with burning fossil fuels have cost the U.S. economy $240 billion per year in the last decade. Economic losses due to extreme weather have doubled in the last ten years. To illustrate this point, the authors point out that Hurricanes Harvey, Irma and Maria caused an estimated $300 billion in damages, which is double the $145 billion in losses caused by all hurricanes in the last decade. The press release points out that the number of extreme weather events costing $1 billion or more in damages has increased by 400 percent since the 1980s. Iowa, for example, has endured three floods costing more than $1 billion in the last decade, up three fold since the 1990s. If climate change is not curtailed, researchers predict annual costs associated with severe weather and the health impacts of greenhouse gases will reach $360 billion. A study published in the journal Science found that climate change will likely cause economic damages for the poorest parts of the U.S. while economically benefiting more affluent areas. Researchers figured the economic costs of climate-related impacts like rising sea levels, more extreme weather and higher temperatures. They ran many simulations which calculated the potential costs and benefits of each phenomenon for a variety of industries and business sectors. They figured that on average, the U.S. will lose roughly 0.7 percent gross domestic product (GDP) per 1 degree Fahrenheit increase in global temperatures. This economic burden, however, will not be shared equally by all parts of the country. The poorest counties in the U.S., which are mostly in the South and southern Midwest, are likely to suffer the most intense economic downturn, with some counties expected to lose more than 20 percent of their gross county product. Iowa will likely fall in line with projections for the Midwest. Researchers warned that agricultural markets could see economic devastation similar to that experienced during the Dust Bowl. Dr. Craig Just is an assistant professor of Civil and Environmental Engineering at the University of Iowa. Up for tenure this summer, Dr. Just teaches graduate level courses along with an undergraduate principles of environmental engineering course. His research interests range from freshwater mussels’ impacts on the nitrogen cycles in rivers and streams to the fate of explosive chemicals once they are released into the natural environment. Iowa Environmental Focus caught up with Dr. Just to discuss his research on wastewater treatment in smaller communities. Jenna Ladd: I wanted to focus on your wastewater treatment research in smaller communities. So, why can’t people in smaller communities flush their toilets affordably? Dr. Craig Just: So, in a town like Iowa City, we just had an over $15 million expansion to our wastewater treatment plant but that cost was spread, you know, among a population base of 75,000 or 80,000 people so the per person cost for such an advance treatment system is under probably a thousand bucks each, give or take, prorate over a certain amount of time. But for smaller towns, who have increasingly rigorous environmental regulations they have to meet, particularly with respect to the discharge of ammonia and bacteria, they’re small so when you have to do a technology upgrade, it’s more expensive per resident and that’s one of the main issues. The other issue is that it also becomes more expensive then to pay an operator for the plant, someone that has the expertise needed to operate an increasingly more sophisticated treatment system. So, then you have to spread that cost amongst a small population base as well and so both of those factors are really scaling issues that, really, small towns have a problem dealing with compared to some other places. Those are some of the main issues going on there. Jenna Ladd: How were those issues brought to your attention? Dr. Craig Just: Sometimes it’s with screaming mayors at small town hall meetings. I’ve been going to Des Moines to talk about this issue since at least 2005. Legislators know it’s a problem, their constitutes tell them it’s a problem. In 2010, I was one of the co-leaders of what’s known as the faculty engagement tour. We get faculty who are typically stuffed in their offices and labs and we stuff them in a bus and took them all around Iowa to say, “You know, here are the people that pay your salaries, really, in a way, and let’s be aware.” So, we had a town hall meeting in Goodell, Iowa, town of about 225 people facing a $2.2 million waste water treatment plant upgrade bill and the mayor of that town and the mayor of three or four other towns came to this meeting. Over 100 people showed up to this meeting in all that was left of the school, the old gymnasium. The school’s gone….Everybody came out, it was such a big deal. People were mad, they were shouting. They viewed me as part of the cultural elite who wasn’t doing enough for them in rural Iowa, and that we were putting unrealistic environmental constraints on them that led them to essentially go bankrupt as a town. So I’ve heard it in casual conversation, I’ve heard legislators talk about it, I’ve heard it in town hall meetings. Candidly, at this point it’s hard for me to get away from. I’m from rural Iowa, you know, that’s where I’m from. So I’ve seen it first hand, it’s not hard to see. JL: Are these newer wastewater treatment regulations or are communities just kind of playing catch up to those regulations that were already in place? CJ: They’re new, and I would say that they’re based at the federal level. I would say one of the things that’s happening, and it’s a challenge for Iowa in particular, so the population in the U.S. has gone up. I think in just the U.S. alone, we’re up to like 330 million people now, whatever, 50 years ago, I think it was like 200 million or something. I don’t know those numbers, but the point is the overall population density has been going up. Most towns in these watersheds that have a discharge into a stream, most of them have gotten more dense so then you have to have more stringent regulations to not kill the stream. But when you apply those things at the federal level for the National Pollution Discharge Elimination System, it kind of puts a disproportionate burden on the places that haven’t grown. In fact, in rural Iowa, it’s less dense but then you still have to meet these federal standards which are somewhat one-size-fits all and so, I don’t disagree with the fact that the federal standards have become more strict but it’s difficult to apply it in a place that’s population and tax base isn’t growing. It puts rural Iowa at a very special pinch point where those two things converge. JL: Are there any solutions you’ve come up with for this problem? CJ: Well, first of all, there are already some alternative technologies, they’re called, that are approved in Iowa that are robust and more affordable, not as affordable as you might like but still more affordable. So, one of the things that we’re doing in partnership with H.R. Green Consulting Engineers, one of our alums there Matt Wildman has really kind of led the use of this technology in Iowa. We’ve partnered with them and the community of Walker, Iowa to extensively test one of these alternative technologies called—it’s a lagoon modification—a submerged attached growth reactor, essentially rocks in a box. A couple lagoons. The lagoons are aerated, they take care of some of the wastewater issues and then it goes to these rocks in a box where the bacteria then are attached to the rocks, they further covert the ammonia with aeration to nitrate, which you can still legally discharge in Iowa—it’s a fertilizer though. It doesn’t solve all of our problems if you look at the broader watershed problems with respect to nutrient discharges, but yet it removes the acute toxicity associated with ammonia discharges. So, that works out well in many regards. It still doesn’t solve all the problems because at least, approximately half the cost of the system is just the pipes that collect the waste from each house and those systems are deteriorating in these towns as well. So, even if we’re improving the system at the end of all those pipes it still kind of tricky to deal with that. I’m even thinking of almost having your toilet be more like an appliance where you don’t have to convey your waste someplace else. If we could find a way to do that, almost like a compost toilet would work, the composting waste you’d have to collect. The nice thing about that sort of a mentality is you could then use that waste as a resource because there are nutrients in there, there is energy value in that waste. Right now we send it to a lagoon and then one of these box of rocks with bacteria, we treat it but we don’t harvest any of the energy…in fact, we have to put energy in. I think if we could find ways to do that, even in these small towns, then it would make them more sustainable. It would give them extra resources that I think would be valuable. So in the future, I think it would be valuable to maybe not have these lagoons at all. Especially for these towns that are increasingly small, you know, like 600 people or less. But anyway, so I’m thinking even longer term, but in the short-term, these alternative technologies are better. One of the things that we’ve been able to do then, with all this data collection that’s been going on in Walker since 2013 is now, we can more appropriately size the technology. Since we didn’t have very much data before, we kind of over-sized it in the name of kind of a safety factor. Now with data, we can shrink the size which then makes it cheaper. So that’s where the researcher comes in. As a researcher, I can come in, get this data, say “No, it doesn’t need to be this big” and then work with Iowa Department of Natural Resources to get that approved. That just recently happened. So, now going forward this particular technology can now be about a third smaller, which would have saved Walker, Iowa about $150,000 on a 2.5 million project. That’s real money. 750 people and $150,000 saved, that would be a lot. You multiple that across the nearly 800 or 900 communities these technologies are targeting so that’s a lot of money that Iowans can save. That’s kind of where research and the practical nature of trying to make things affordable come together. Sizing things appropriately so they still work and then making sure the operators still know how to handle any disruptions and understand why things do get disrupted from time to time. JL: Are you communicating with people working to solve these problems in rural communities in other states? CJ: In general, Iowa is a little bit behind. Even our peers on our borders: Minnesota would be ahead of us in many regards, some other places too. A lot of these alternative technologies have been utilized in warmer climates. Since they’re biological processes, the bacteria work better when they’re warm, just like you or I do. I don’t move so fast when I’m cold and neither do bacteria. So the challenge for Iowa has been even though some other states have been embracing these alternative technologies more readily, they are easier case studies too. So really, for Iowa, it’s been “How do we manage the cold weather?” that we have and “Will these systems still work when it’s cold?” So, we’ve applied what we can from other states in trying to catch up and now we have to deal with that in our own Iowa circumstance going forward. So yeah, we’ve learned from other places, but we still have to make sure we deal with, you know, Iowa’s situation. JL: In what ways does this research relate to your teaching? CJ: Increasingly, developing countries, where again you lack a population base and kind of a resource base and a tax base, some of the challenges are like rural areas in the United States. They’re kind of falling into some of those same categories sometimes so I want our engineers that graduate from our program to understand the rural dilemma. It’s relatively easy to be an engineer when you have all the resources you need, you got money. Yeah, shoot, design away, and it’s fun to kind of do it like that, but when you have to apply your engineering skills and really your community engagement skills at the same time to try to make a difference in a community that’s struggling just to keep their doors open, that’s a cool place. That’s very satisfying and rewarding for an engineer to be operating there. So I’m encouraging our students to do that in some way or another so when they go out into engineering and consulting, they’ll be aware of the issues that small rural communities face in contrast to what growing, urban areas face: fundamentally different engineering problems.